Remember the scene in the original Karate Kid movie where the old sensei instructs his young protégé in the finer points of car polishing…. “wax on, wax off!”? 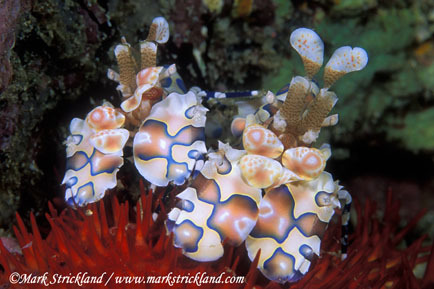 Watching a pair of Harlequin Shrimp waving their flat, paddle-like claws in slow, concentric circles, I can’t get that scene out of my mind. These gentle-looking, inch-long crustaceans are hardly as agile as even a beginning Karate student, yet are fierce predators nonetheless. Found throughout the tropical Indo-Pacific, they feed exclusively on sea stars, attacking and eventually subduing animals that may be 100 times their own weight and size. Even the huge, voracious Crown-of-Thorns, which have almost no natural enemies, are not safe around these guys. If you’ve ever tried to lift a large sea star from a rocky substrate, you know about their strong grip… it takes considerable effort even for a human. It’s hard to imagine how these little shrimp could prevail over such forces, but they take it in stride. Working as a team, one shrimp methodically snips suction-tube feet from each arm of its prey. 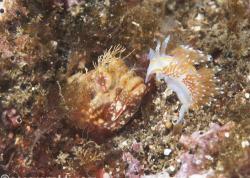 Meanwhile, its partner grabs an arm-tip and backs up like a tractor, gradually pulling the sea star over onto its back. Once that’s accomplished, the pair drag their hapless victim off to a preferred dining spot, typically under a rocky ledge or coral head. Subduing such large prey must be a real challenge, but eating it all in one sitting would be a physical impossibility. However, nothing goes to waste, as the shrimp devour the sea star one arm at a time, keeping the increasingly disfigured animal as a live captive until every bit is eaten. Depending on the size of the sea star, this process may take up to two weeks… pretty horrific, huh? Maybe Karate Kid isn’t the best movie reference for these remorseless killers after all; Hannibal Lecter in Silence of the Lambs suddenly seems more appropriate! 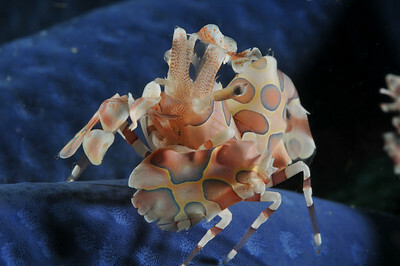 Most photos of Harlequin Shrimp that you see have been taken in Lembeh, Seraya Bali, or Hawaii. Sightings are not guaranteed, although sometimes the same shrimp will be seen at one location for several months. 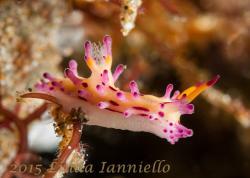 I've also seen photos of Harlequin shrimp taken in Anilao, Cebu, Puerto Galera, Mabul, Walindi Papua New Guinea, Ambon, Thailand (Andaman Sea), Costa Rica (pacific coast) and Kumami Japan. A good guide will know the dive sites where they may be found. They can be difficult subjects to find. It's important as a photographer to respect underwater marine life, and not to overly harass these shrimp just to get the perfect shot. I've heard stories of dive guides keeping them in a bag, and putting them out when it's time for a diver to get a shot. This is terrible and behavior like this should be actively discouraged by all divers. The best thing to do, is to enjoy whatever marine life you find underwater, and not to pressure dive guides to find any one particular species. 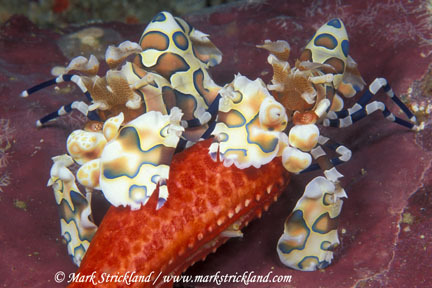 When you do photograph Harlequin shrimp, be very careful not to overexpose them, and use manual strobe power if necessary. Dangers: Aquarium trade. Do not disclose exact locations online. Behaviour: Comes out at dusk and dawn, usually in pairs - the female is larger. Submitted by Anonymous on Mon, 2011-12-19 10:29. Submitted by Anonymous on Mon, 2011-12-19 10:24. Submitted by Anonymous on Fri, 2010-09-17 16:18. I heard that flash can make them blind. Is it true? Submitted by smb2 on Wed, 2010-08-11 18:31. Nice article and great shots. 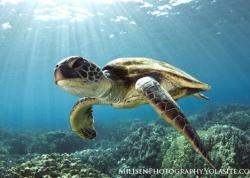 I would add the Pacific coast of Costa Rica as a location for possible sightings.